Whether Apple's thinner, lighter iPad 2 is greener than its predecessor is up for debate. What isn't, however, is our roundup of 14 sustainable sheaths that will safeguard your investment for the long haul, built-in obsolescence be damned. Above, a sturdy shell-case by Vers ($79.95), handcrafted from U.S.-grown hardwood or bamboo and reinforced with steel for added strength. If an iPad 2 is in your future, then make it go the distance with one of these 14 eco-friendly cases and bags. From cushy frames assembled from recycled cork to zippered sleeves made from upcycled wetsuits, these protective scabbards are as kind to the planet as they are to your budget, with the exception of a few splurges we couldn’t resist including. This post was originally published on March 7, 2011. Sewn locally in Washington, Plaid Doctrine's iPad Sleeve is ultra-lightweight, foam-padded, and clad in a water- and stain-resistant fabric derived from recycled plastic bottles. Plus, it's lined with recycled ripstop nylon. Each sleeve is available in two plaid colorways and a chevron print, with pockets aplenty for your charger and headphones. For the lady geek who eschews pink and Swarovski crystals, Reveal's quilted chain-strap iPad bag is feminine but not cloyingly so. The vegan-friendly accoutrement consists of luxury-grade faux leather, satin derived from recycled plastic bottles, and a lining made from recycled microsuede. Treegloo's customizable iPad cases encases your precious cargo in a mitered hardwood frame, made from pine grown and milled in the United States. The company bonds its ultraviolet-resistant, faux-leather cover, also produced stateside, with a speciality, low-VOC (volatile organic compounds) adhesive that protects against delamination under high heat. The pièce de résistance? Attractive linen or Forestry Stewardship Council-certified paper liners—choose from solid colors or fancy map-based prints—manufactured proudly, once again, in the U.S. of A. The best part about Nau's iPad "Stash" isn't that it's die-cut from 100 percent reclaimed wool felt (although that's pretty nifty) but that its front cover folds back to become a built-in stand. Thirty percent thinner than its predecessor, the Eco-Vue iPad 2 case by Marware comprises ecologically produced leather that adheres to strict Restriction of Hazardous Substances standards. In addition to a camera cut-out hole in the back, the cover also includes a low-angle, foldaway tabletop stand for your tapping comfort. If water-resistance is what you seek, then you can't do better than an iPad sleeve upcycled from scrap wetsuit material. The plush neoprene protects your tablet from accidental scratches, bumps, and drops, while zippered pockets hold loose change and other miscellanea. You don't have to be partial to pooches to love LostDog's iPad case-and-stand combo, which cushions your gadget in recycled—and recyclable—suede-like microfiber. Bonus: The cover comes with a microfiber cleaning pad for keeping your screen free of dust, smudges, and bagel crumbs. 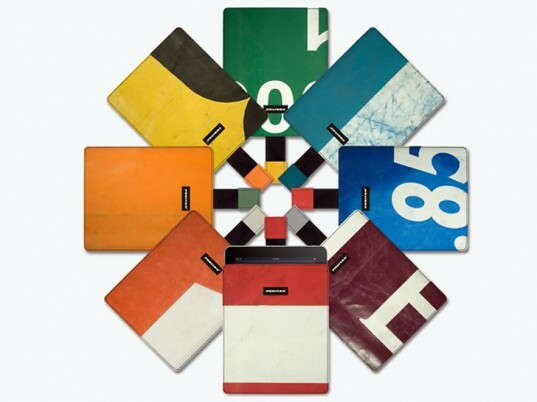 Made from recycled truck tarpaulins, the F23 iPad Sleeve by Freitag includes a handy quick-out strap inspired by parachutists. Each one-of-a-kind envelope includes a velvety lining to coddle your gear from bruises and falls. 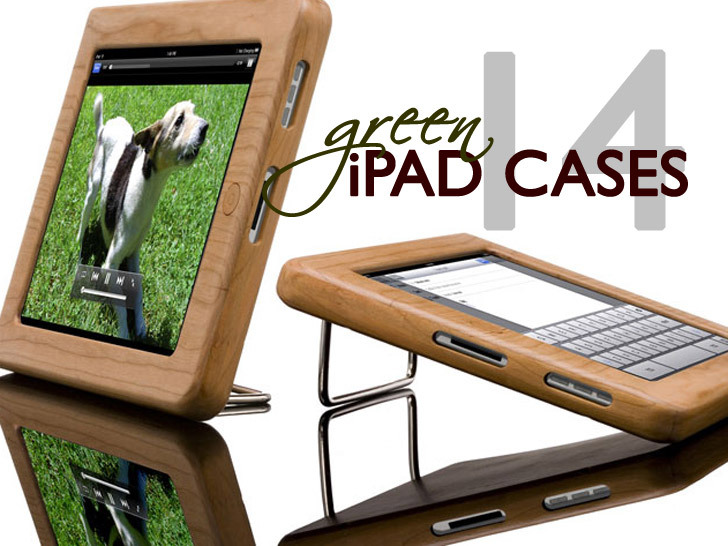 A Produkt offers an unfussy yet elegant iPad chassis derived entirely from recycled (and recyclable) cork. The ergonomically designed Kork features strategically positioned cutouts for easy access to buttons and inputs, as well as an angled audio output for front-projected sound. Designer Blythe King stitches her padded iPad cases form vintage fabrics. Nothing is sacrosanct, whether it's a hot-pink houndstooth wool knit or an old World War II Navy uniform, military insignia and all. Topped with buttons from an earlier era, each one-of-a-kind cozy will keep your iPad securely under wraps. Encase your iPad in one of Dewdrop Designs' buttery soft reclaimed-leather sleeves. Hand-stitched from production offcuts, and colored with all-natural dyes, each screen-printed sheath makes a graphic yet charmingly whimsical statement. Built from scratch in San Francisco, the Rickshaw Bagworks' iPad 2 messenger by Rickshaw Bagworks wraps your device in a sturdy performance tweed derived from 100 percent recycled PET. And although the bag is designed to leave behind minimal waste, it's certainly more than generous with interior space. Besides a dedicated pocket for your iPad, you'll also find a large rear compartment with room for paperwork, accessories, a book for your commute, and a just-in-case change of underwear. Cobbled together from repurposed neoprene, Keen's Harvest II iPad Sleeve is a no-frills option that offers protection without the bulk in your choice of four colorways. At $15, its price tag is equally unassuming.